Skill: Quack-fu (learnt from Darkwing, she improve the moves with her own version of it), very skilled with her weapon and sometime uses Darkwing’s gadgets. Weaknesses: She is just as clumsy as Darkwing Duck, anger problems (or as Darkwing would say a royal tantrum) and she is over confident which lets her guard down. Character Theme music: Remix of the Bushroot stage music from the Darkwing Duck game on the Gameboy/Nintendo. She is very tough but also caring, has a big ego and a strong sense of justice just like her cousin Darkwing. She face any problems head on and can think on her feet. She enjoy helping her family & friends, and helping Darkwing with crime fighting whenever he asks for help. She’s upbeat, confident and kind but can get overconfident which causes her to lose focus and overdo things. She is short tempered at times and tends to solve her problems with actions over words. Everything changes when the Jewel Thieves attack and succeed in kidnapping their parents and take over the palace. Crystal escaped by knocking the villain out with her jewellery (yup, the villain fell over the jewellery she threw and was knock out cold) and took her sister Gem to safely outside the palace. She will later meet with Darkwing (he fell in due to a flight test going wrong) and thought that he is working with the Jewel Thieves. Crystal knocked Darkwing away which sent him toward the lake and runaway. Darkwing who is confused and surprised by what happened decided to followed her and find out what going on. He finds Crystal who is on her way to her hideout and stop her so he can ask her some questions. Before he could ask, Crystal attacks him nonstop and they start fighting. During that time, some of the members of Jewel Thieves found Crystal’s hideout and kidnap Gem. As they try to run off, they accidentally crash into Crystal and Darkwing. They recove and the thieves grab both Gem and Crystal and run off. Darkwing chases after them and knock out the thieves (with his cool moves) and rescues the princesses. 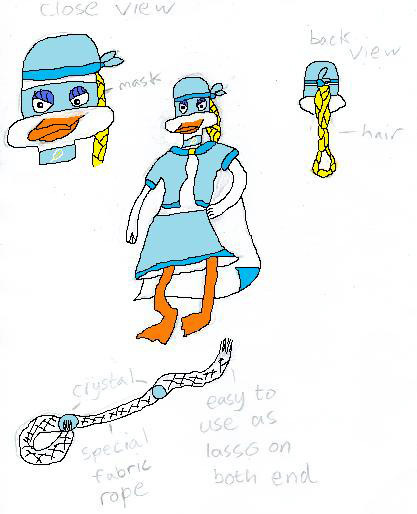 Crystal found out that Darkwing isn’t a member of the Jewel Thieves and that he is a crime fighter from St Canard who just fell in from a test flight. Darkwing then tells them of all his adventures and heroic deeds that he did. Crystal listened as she is interested in his story of crime fighting, beating evil villains and saving the people and the town. Gem explains the situation to him and asks if he could save their family from the Jewel Thieves. Just then the stronger members of Jewel Thieves came and told Darkwing to leave them so that they can take the princesses. Darkwing refuse and attacks them, however they outnumber him 3 to 1 and beat Darkwing up. They grab Gem and was about to get Crystal but was stop by Darkwing who took Crystal and escape using the smoke that he fire from his gas gun. The villains couldn’t find them so they decide to go back to the palace with the kidnap Gem. Deep in the cave, Crystal got angry at Darkwing for leaving her sister behind and said that he is no hero. Darkwing said that he have to save her and explains that he need to recover so that he can fight the villains. Crystal than said that Darkwing can’t beat them because they are too strong and there are too many of them. Darkwing replies that it doesn’t matter if they outnumber or that they are strong, what matters is his sense of justice and that a true hero will always do his best and rescue the innocents and the people that he cares about. Crystal watched Darkwing as he leave for the palace to rescue her family. She think back on what he just said and she now know that Darkwing is a real hero. She knew that Darkwing will need help so she decides to sneak into her room in the palace. She used the secret passage that she used to escape from the palace and went to her room. She took her clothes from the dresser and quickly made crime fighter clothes and a rope lasso with crystals near the end of the rope. This will help her swing to places and the crystal balls act like a wrecking ball on a chain. If she throws it, the crystal will hit the enemies really hard. She then ran to the throne room where she sees Darkwing fighting the Jewel Thieves. She jump in and started beating them up. Darkwing was surprise to see the newcomer and told her that he did not need any help. She replies that a hero will always help their friends and then she continues to beat the villains up. Both Darkwing and Crystal were knocking out the weak members of the Jewel Thieves until one of the stronger members was able to grab Crystal and took her mask off. Darkwing was shock to find out that the newcomer was Crystal. He quickly rush in and beat up the villain (the one who is holding Crystal) and free her. Crystal was surprised that Darkwing didn’t recognize her. Darkwing was embarrassed about it so he said that the mask hide her identity. They then found themselves surrounded and outnumbered by the villains when all of a sudden the royal guards came in with Quiverwing Quack (Gosalyn) and Launchpad. They explain that they were looking for him when the plane crashed and that they followed the tracking device (which was in the plane) to this island. They later found out that the island is in danger and went to the palace where they found and free the king, queen, princess and guards. Quiverwing, Launchpad and the guards went in and start to beat the villains up. Darkwing and Crystal work together to defeat the strong members of the thieves and then they went on to face the leader of the thieves. After a hard battle (the leader are always the hardest to defeat), they finally won and send the leader and his Jewel Thieves into prisons. Crystal and her family thank Darkwing, Quiverwing and Launchpad for saving them. Launchpad said that if Darkwing hadn’t taken the wrong plane (Darkwing was helping S.H.U.S.H in testing plane, he was to see if the plane was any good for missions, he happen to take the wrong one which is not finish), then he would have never land in the valley and the villain would have won (so basically I saying that Darkwing save the whole valley, hooray for Darkwing). Darkwing then ask Launchpad if the pilot was ok (Darkwing can’t fly a plane so S.H.U.S.H sent one of their own pilot since Launchpad was busy doing the shopping), Launchpad told Darkwing that the pilot was in shock since it was his first crashed but he was unharmed. Launchpad then comments that the pilot will fly a plane way better than before (Launchpad crashed a lot and he is a great pilot). They then help Crystal in cleaning the palace since it is in a lot of mess due to the fighting. Crystal, Darkwing, Launchpad and Quiverwing were cleaning the library until Quiverwing found a book of the Royalfeather family tree. Crystal points out each of her family until Quiverwing notice one of the members has the “Mallard” last name. Crystal told them the story about it. It all started a long time ago with a female duck called Miss Mallard who was trying to get to a certain country. She accidentally got lost and arrived in Jewel Valley. She went into town to find a map so that she can continue with her travel. She did not notice that a piece of rope was stuck to her shoe. She walks across the street and then all of a sudden there were loud voices shouting. The prince has been kidnapped by one of the member of Jewel Thieves and that he was getting away. Miss Mallard try to run out of harm’s way but she accidentally pulled the rope with her shoe which causes the thief to trip over the rope. The prince was able to escape from the thief and he ran to a safe place. The thief was angry but knew that he couldn’t win so he ran away. The prince fell in love with Miss Mallard and told her that he will repay her by marrying her. Miss Mallard explained that it was an accident but was glad that she saved him. After that she marries into the Royalfeather family. Darkwing, Launchpad and Quiverwing were amazed about the story. They took a closer look at the picture. Launchpad then said that this Miss Mallard look a bit like Darkwing and wonder if she is a relative of his. Darkwing look at Launchpad and told him to be quiet. Launchpad cover his beak and apologizes to Darkwing. Crystal who was shock to hear that, decided to pull Darkwing’s mask and hat off so that she can see him. She looked at the picture and then at Darkwing. Darkwing got angry at her for pulling his mask and hat off and took them back from her. Crystal found out that they are related and asks Darkwing who he is. Darkwing who sighs in defeat tells her his real name. Crystal asked why he made another identity when he can use his real identity to fight crime (she doesn’t understand since she has been raised inside the palace all her life). Darkwing then explains the reasons to Crystal. After he finished explaining he then said that they are long distance cousins and Miss Mallard is his long distance auntie. Crystal told Darkwing that she will keep his identity secret and that she won’t tell her family about this. Darkwing, Quiverwing and Launchpad went back to St Canard after they finished the repair to the palace. Back in Drake’s house, they were watching TV until they heard a knock on their door. Drake opened the door and saw a female duck waiting for him. She said that her name is Crest Mallard and that she is Drake’s long distance cousin. Drake was confused and before he can ask her, Crest push him inside and close the door. Both Gosalyn and Launchpad look at them and wonder who Crest is. After a few hints from Crest, they discovered that she is in fact Crystal Royalfeather who is wearing normal clothes. Drake asks why she dress up like that, she reply that a crime fighter need secret identity in order to protect their friends and family (she learnt that from Darkwing). He then asks her how she was able to find him when he never mentions his address to her. She gave him a piece of paper and told him that he dropped it when they were cleaning the palace. He look at the paper and found out that it was the letter that was sent to his address from Gosalyn’s school. Drake wonders why he kept that letter with him when he went out. He read the letter which said that Gosalyn needs a cute fairy costume for the play in school. Drake remembers that he needed the letter to remind him to buy the costume for Gosalyn. He would usually leave it on the fridge but knew that Gosalyn would grab it and rip it to pieces since she doesn’t like the costume and the play (she said that they were too girly for her). Crest then said that if Darkwing need help, the crime fighting princess Crystal Royalfeather will come to help him. Drake replies that Darkwing can fight crime on his own. Gosalyn jumped in and said that if Darkwing is in deep trouble, Quiverwing will come to his rescue. Drake look at Gosalyn and said to her that he was going to cut her allowance in half which caused Gosalyn to complain. Crystal laughs which make the others laughs as well. Drake then said that he was only joking and that he is glad that he has great backups. Gosalyn smiles and said that Quiverwing, Launchpad, Crystal and the Justice Ducks are here to help Darkwing fights crimes. Launchpad then asks Crest about her family back on Jewel Valley. She said that she told her family that she wanted to travel and that she will always visit them at home and that she will help them with their royal duties as well as her own duties. After that Crystal stays with the Mallards and she helps Darkwing whenever he needs it. Also she sometimes goes on adventures by herself which include travelling to different places, helping people in need and fighting crimes (which involve fighting villains and super villains). Funny moments: She doesn’t know how to cook and you should never let her cook. Here is what happened: Drake came into the kitchen, only to find it in a big mess and with Crest standing in the middle covered with flour and chocolate. Crest: ”You do not want to know. I was trying to make chocolate cheesecake. I thought it would be easy, I just put the chocolate in the cheese, then put it on the cake and then put it in the oven to cook”. Drake look at Crest with a shock look on his face. Drake: ”You are supposed to mix the cheese and chocolate together and then put it on the biscuit base and then put it in the fridge to set”. Crest: ”So that’s what I did wrong, sorry about that”. Drake: ” If we ever get taken hostage by the villains, I am going to send them to the kitchen with you”. Crest smiled and said “Sure, then I will beat them with my lousy cooking”. And that how she got the nickname. Crystal wants to meet Darkwing’s girlfriend as she heard a lot about her from Darkwing. They both went to Morgana’s house and saw her tending to her monster plants. Darkwing calls out to her and then walks over to her. He was about to introduce his cousin until he was blasted by Morgana’s magic spell. Darkwing then ran and dodged her magic while Crystal who was confused stood back and watched them. Morgana was not happy with Darkwing and kept blasting him with magic. Darkwing was confused and had no idea what he did to make her this upset. After dodging another magic, he quickly told her that he wanted to introduce his cousin to her. Morgana stopped and asked him about his cousin. Crystal then introduces herself to Morgana and explains that she wanted to meet her as she heard great things about her from her cousin. Morgana looked at them and started to apologize to Darkwing and said that she thought that he dumped her for Crystal. Darkwing and Crystal look at each other with shocked looks on their faces and said at the same time that they are cousins. Morgana kisses Darkwing and then shakes hands with Crystal. They spend the day talking and getting to know each other. After that Crystal and Morgana became best friends. The first meeting of the villains always start with a misunderstanding. The villains thought that Crystal is Darkwing’s girlfriend which causes both Crystal and Darkwing to look at each other with shocked looks on their faces. They both make a “ewwww” sound and say that they are cousins. Darkwing will then say that his family is full of crime fighters (the reason why he said that is because Darkwing think that it will make him seem amazing, cool and awesome. What Darkwing said about his family is partly true since Crystal and Quiverwing are crime fighters. I would like to say that the villains don’t know that Quiverwing is Darkwing’s daughter). The only villain that doesn’t know about them being cousins is Megavolt. Megavolt is very forgetful so no matter how many times they tell him, he will always forget. Here is an example: Darkwing is chasing Megavolt around the city. Just as Megavolt was about to escape, he was stop[ed by Crystal. Darkwing and Crystal: ”This will be the fifth time”. Megavolt: ”That many? I guess I lost count… or did I forget”. And this happen every time they face Megavolt.